Well, wow! Vann Newkirk II reviewed my book for the New York Times, alongside Zachary Roth’s The Great Suppression. It’s an honor. 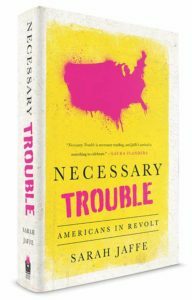 Necessary Trouble depicts the country as a pot set above the flames of economic discontent, ready to boil over. Jaffe, a journalist and a fellow at the Nation Institute, posits that what agitates these groups is economic injustice, and the book does well to set up the financial collapse of 2008 as the beginning of the great conflagration that set them all in motion. … Necessary Troubleshines in its assessment of why these fault lines exist in the first place. Capitalism, Jaffe argues, promotes instability and class divisions… and her book finds the thread of economic injustice in every tapestry it weaves.